Ends of various shapes, pointed or blunt, scalloped, forked, spatulated. Rectangular associated cells which turn blue. Irregurlarly shaped fiber ends and walls. Looks like woodpulp (vessels) and straw pulp. 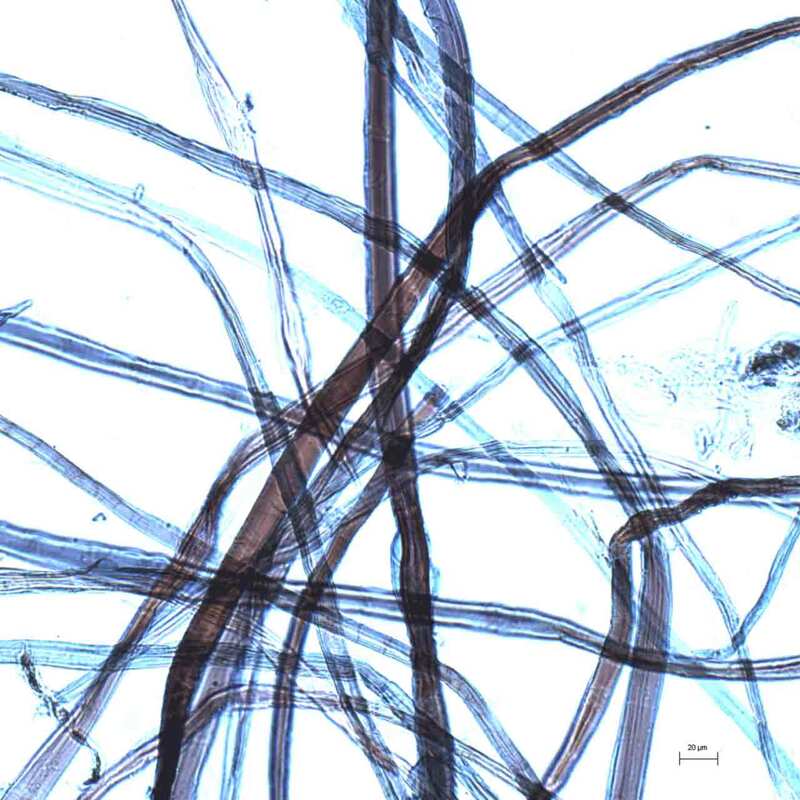 Fibers often covered with a translucent membrane which is the most characteristic element of the paper mulberry fiber. Usually thick but irregular fiber walls with crosses. Red with blue lumen membrane. Native to the Pacific region (Polynesia). Native or cultivated in Burma, Cambodia, China (Anhui, Fujian, Gansu, Guangdong, Guangxi, Guizhou, Hainan, Hebei, Henan, Hubei, Hunan, Jiangsu, Jiangxi, Shaanxi, Shandong, Shanxi, Sichuan, South East Xizang/Tibet, Yunnan, Zhejiang), India (Sikkim), Japan, Korea, Laos, Malaysia, Thailand, Taiwan, Vietnam. Grows in China until 2500m. Anhui, Fujian, Gansu, Guangdong, Guangxi, Guizhou, Henan, Hainan, Hebei, Hubei, Hunan, Jiangsu, Jiangxi, Shanxi,Shaanxi, Shandong, Sichuan, South East Xizang (Tibet), Yunnan, Zhejiang. Chūbu (Niigata,Toyama, Ishikawa,Fukui, Nagano, Gifu, Shizuoka, Aichi Prefectures), Chūgoku (Shimane Prefecture), Kansai (Kyoto, Hyogo, Nara Prefectures), Kantō (Ibaraki, Tochigi, Saitama Prefectures), Kyūshū (Fukuoka, Kumamoto, Oita, Kagoshima Prefectures), Shikoku (Tokushima, Ehime, Kochi Prefectures), Tōhoku (Iwate , Miyagi, Fukushima Prefectures). Gyeonggi (Gapyeong, Mungyeong, Gyeongin, Yeongin), Gangwon (Wonju), Chungcheong (Danyang, Goesan) Gyeongsang (Andong, Chongsong, Uiryeong, Hamyang, Jinju), Jeolla (Imsil, Namwon, Jeonjiu). 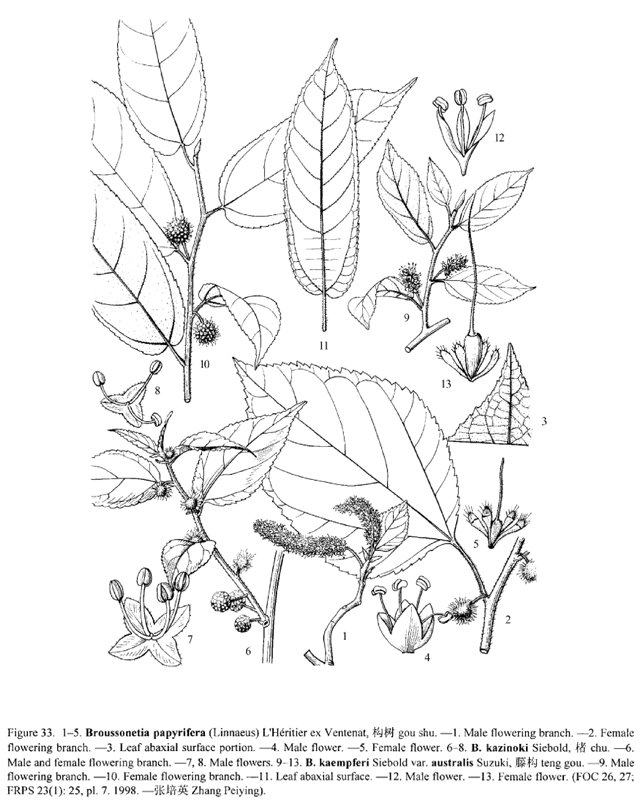 Brousonnetias are a genus of the Moraceae family, which includes several species which the main are B. papyrifera, B. kazinoki, B. kaempferi, B. kurzii. 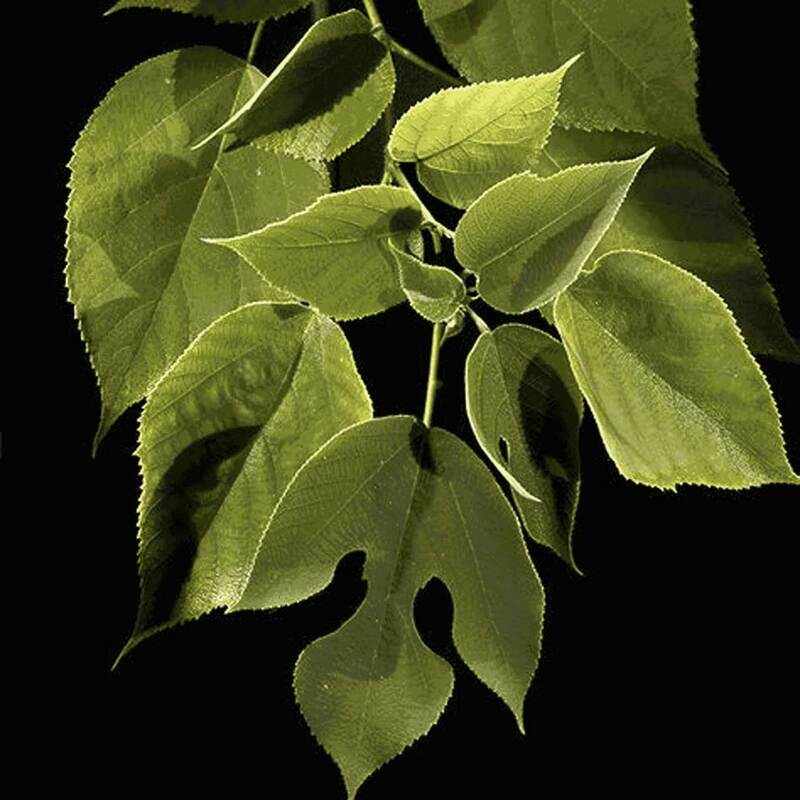 Brousonnetia papyrifera is a deciduous shrub which grows in the wild but can be cultivated; it can reach 15m in height. The species is dioecious. The fruits are edible. It grows as well on flat ground, allowing an easy harvest, as on hillside, where land is less desirable for other cultures. It accommodates both dry lands and wetlands. Its cultivation is quite easy but it's Brousonnetia kazinoki being simpler, the two species are often planted in mixed fields. Cultivated shrubs provide better fibers than the wild ones; they are thick, long and strong. Its growth is slow, however, the harvest can take place each year. The use of Broussonetia barks in the manufacture of paper, originated probably in the ancient production of barkcloth (tapa), especially in the South and Southwest. Paper mulberry is harvested, grown or sold for the manufacture of cloth very early, under the Shang (-17th / 11th-century). The earliest mention of the use of bark in the manufacture of paper can be found in the biography of Cai-Lun, within the "Hou Han shu " or "History of the Later Han Dynasty" by Fan Yeh, dating from the 5th century and the use seems to have started with Cai Lun in the second century. Papers made with paper mulberry are already popular under the Jin (265-420); under the Tang (618-907), these papers are quite common for writing. Papers for calligraphy and painting in the Ming Dynasty (1368-1644) are often made from a mixture of bark and bamboo or sometimes straw. At all times they are also used for making money paper, clothes, for bookbinding, in the interiors, etc. At the end of the Tang Dynasty lightweight armors are made with paper, which are able to stop the arrows; they will be used even under the Qing (1644-1911) by the tribes of the south, Yunnan, Guizhou, Guangxi. 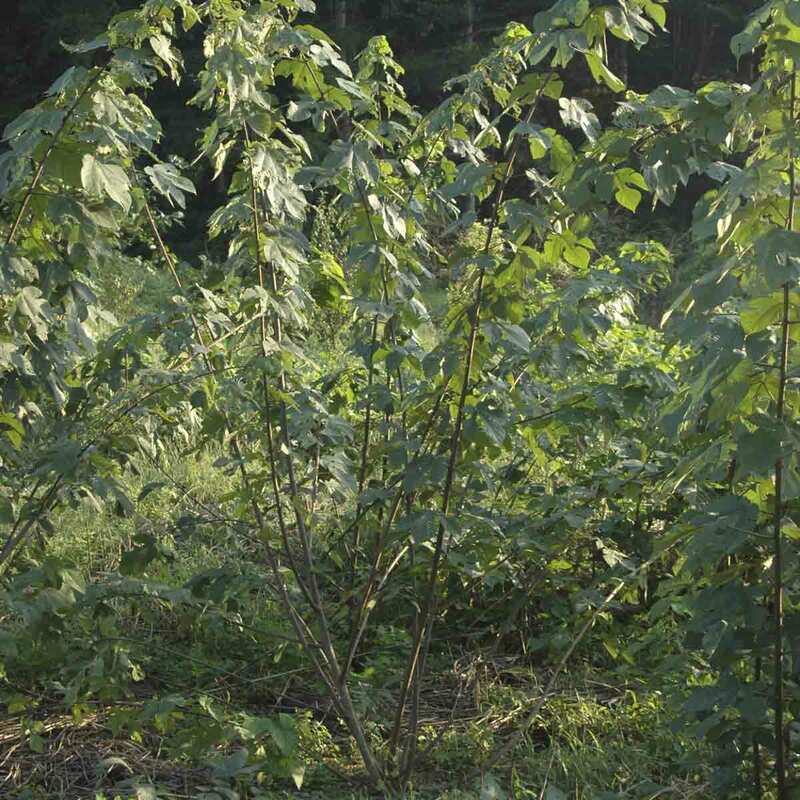 Papermakers formerly cultivated their own fields of kozo (Broussonetia papyrifera) but now with rare exceptions, kozo or kazinoki (Broussonetia kazinoki) are grown by farmers in addition to food crops and are sold to paper makers. However, some papermakers still gather together to grow and harvest the bark at the place where paper is manufactured. The paper is produced in many regions of Japan. Kozo was used early in the manufacture of paper. The earliest papers in Japan (family records of families from Mino - Gifu, Chikuzen – Fukuoka et Buzen – Oita) dating from 702, are kozo papers. The first great era of paper production in Japan covers the Nara period (710-794) and Heian period (794-1185). During these periods, Japan is dominated by a bureaucracy on the Chinese model that requires the use of large quantities of paper. The practice of copying sutras also requires the production of high quality white paper. The government encourages the establishment of paper mills but they remain under the control of local authorities. Local lords control the production because paper is a ware used as tax. The first papers are produced by the tamezuki method up to the Heian period when they are replaced by the nagashizuki method (see papermaking process). Techniques improve during the Heian period and kozo and gampi (Wikstroemia) will take the place of hemp. Kozo takes the greatest space because it is easier than hemp and can be grown easily everywhere; gampi has a more limited use because as it could not be cultivated, harvesting is restricted to wild shrubs. The second great period runs from the Kamakura period (1185-1333) until the end of the Meiji period (1868-1912). The demand for paper increases enormously during the feudal period. Production increases in quantity, quality and variety. During the Edo period (1603-1868), kozo is grown and used in paper manufactures in many parts of Japan. The paper changes its status, from taxes, it takes the status of goods exported to the large cities. This lucrative trade is under the control of the clans of samurais. During the Goryeo period (918-1392) the government encourages the development of the paper industry and Buddhism introduced in the fourth century, became in this period the dominant religion, sacred texts are widely copied and then printed. The development of printing that allows the publication of numerous books, enhance the need to produce more paper. The Joseon government (1392 - 1910) in front of the magnitude of demand will encourage the diversification of raw materials. Gradually fibers of various kinds are mixed with dak fibers and quality which made the reputation of Korean paper at the beginning of the Joseon period, decreased significantly from the 16th century. The mulberry papers are used for calligraphy, official documents, printing. In the arts, they serve as support for painting, prints, scroll paintings mounting, screens or sliding doors. They are widely used in homes to cover windows, sliding doors, walls and floors and in different crafts where they are used to make domestic purpose objects, boxes, jars, umbrellas, lanterns, fans, textiles, toys etc. Finally, they are also found in religious or ceremonial articles. Harvesting takes place in the spring. The bark is peeled directly from the branches or after steaming. In this case, the branches are put in bundles and the peeling of the bark is done after steaming or cooking in boiling water inside a closed tank. The bark can then either be dried in the sun or let to ferment. In the first case, the impurities are removed by an alkaline cooking (ash lye) that can last several days. If the fermentation process is used, the barks are immersed in water to ferment for several days. They are then rinsed and brown bark is scraped with a knife. They are then immersed in a lime bath for several weeks. The operation is followed by further rinsing. The bark is then crushed by various methods: in a mortar with a pestle or with a trip hammer (foot hammer or with cams activated by water power) on a stone or beaten with mallets or wooden sticks or crushed in a grinder moved by an animal. The bark is then rinsed and let to dry on racks. The bark is ready to make paper after two or three years of storage. Before cooking the bark can be bleached: it is exposed to sunlight in the cold water of a river or on the snow. Cooking in an alkaline solution allows the removal of lignin, pectins, gums and waxes, which would block the separation of fibers during the beating. Alcaline solutions are either made from wood ash or alkaline chemicals (sodium hydroxide or lime). Cooking lasts about two hours but the duration varies depending on the age of the bark and the alkali used. After cooking the barks are rinsed to remove alkali residues. Removing of foreign particles is done by hands in cold water. The pulp is then beaten manually with mallets or sticks, or in the Japanese hollander, the naginata.The pulp is poured into a wooden vat already filled with water and a dispersing agent is added to the pulp which is whipped using a wooden rake.Two methods are used to make the sheet: nagashizuki or tamezuki. In the tamezuki method the amount of needed pulp is taken at once to form the sheet. In the nagashizuki method the sheet is made by superimposing layers of fibers successively until the desired thickness.The sheets are laid one by one on a board equipped with marks, with or without spacer (thread, gras stem) for better separation after pressing. The pressing is done by placing the paper stack under load or in a lever press. The pressing is done at the end of the workday, it lasts usually one night. To make them dry, the sheets are brushed on wooden boards which will be placed outdoors or indoors. Currently heated metal plates are also used.Finally, the sheets are sorted and usually trimmed with a knife using a template. The white bark is left to soak for one day to facilitate the removal of soluble elements and penetration into the fibers of the alkaline solution. Then the bark is cut and assembled into bunches for an alkaline cooking. The barks are placed in a vat containing a caustic lye and boiled for three to four hours. This operation removes lignin and non desirable materials (pectins, starches). Alkaline agents are either plant ashes or alkaline chemicals (soda, lime or sodium carbonate). After cooking, the barks are rinsed in running water for half a day to remove detergent and dissolved substances. The barks are immersed longer in running water, for several days in order to expose them to sunlight and to bleach them. The removal of hard impurities is done by hand in cold water. The pulp is then beaten by various methods: using sticks on a flat stone or a wooden disk, a vertical beater and more recently in the Japanese hollander called naginata. To proceed to sheet making, the tank is first filled with water and the pulp is poured into the vat. The dispersing agent is added and the pulp is whipped. The methods used are called webal, ssangbal and jangpanji. In the webal method, the sheet is usually formed of two layers. The sheet is couched on a wooden board; either one sheet is couched alone, or a second sheet is laid on its surface, head to tail to form a single sheet. The Ssangbal method is derived from Japanese nagashizuki returned after 1900 (the method had been imported in the early 15th century when production should be accelerated). In Jangpanji, which is used for the manufacture of large format sheets, the mould is maintained by two people at each large end. The sheet is formed by successive layers of pulp. In all cases, the sheets are couched with the movable screen in a stack and are separated or not by an intermediate element (thread, grass stem) to facilitate separation after pressing. Before lifting the screen, the pile of sheets is pressed with a wooden roller to eliminate air bubbles. The pressing is carried out under load or in a lever press. The draining is slow (12 hours). To be dried, the sheets are brushed on a smooth surface: wooden desks, on the floor made with oiled papers, on a heated metal plate. Harvesting takes place when the shrub has reached a certain maturity. The bark is peeled directly from the branches. The barks are first placed in clean water for a day to soften them. Then they are boiled in water with lime or in wood ash lye for 5 hours and finally rinsed. The removal of hard impurities is done by hand. Beating is done manually using wooden mallets on a wooden table or the Japanese hollander (naginata). The paper mould used to make the sheet is non movable, it is a cotton canvas stretched over wooden bars. Two methods are used to form the sheets: the mould is immersed and agitated to allow the distribution of the paste, the mould is set to float on the surface of the tank and the pulp measured in the right quantity and diluted in a container is poured over the mould to be evenly distributed by hand. For drying, the mould is placed at an angle in the sun. After complete drying the sheet will be detached by peeling. Papers made with paper mulberry fibers are a modern production in Thailand.